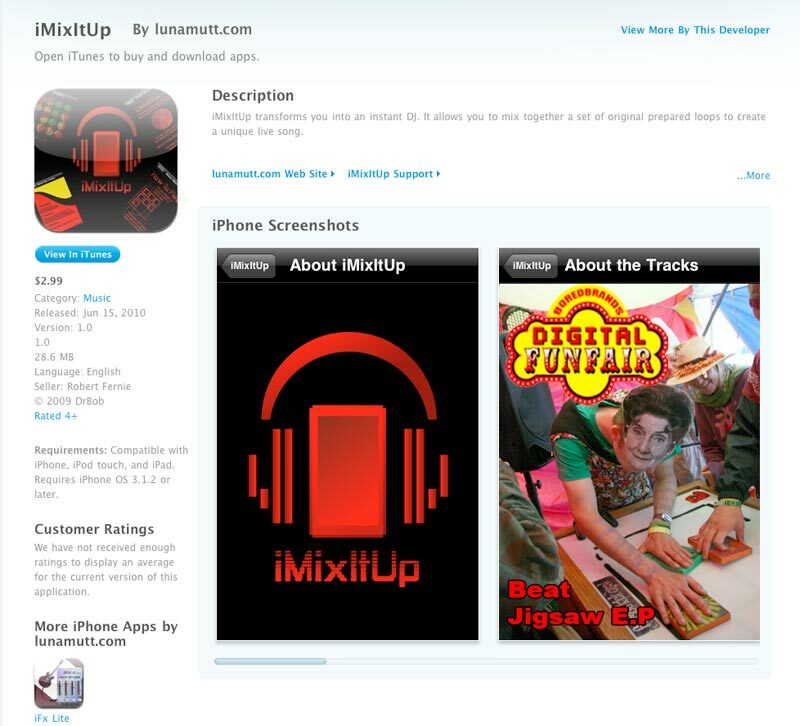 IMIxItUp released for the Iphone - help us create an Interactive Music Label! Lunamutt and the Digital Funfair have released IMixitup a music mixing toy for the iphone (available from the app store now). The app is based on the Beat Jigsaw, a semi-automatic djing table which has been turning festival goers into superstar dj's in UK and Europe for quite some time. We'd love to see IMixItUp become a platform to release other people's music - to become an interactive record label and that is where you come in. We're putting a call out to artists, producers, musicians to send us loops which can be used with our App, like an interactive single. Releasing your music through IMixItUp could be a way of generating income, a bit of fun, a marketing device or a way of kickstarting the interactive music revolution! To be honest we don't really know yet. Here's the deal - your music, your artwork (if you want), our app. You choose the price, how many tracks you want etc. lists as well. The first release is the Beat Jigsaw EP, 3 tracks made by me, with a few Creative Commons, samples. You can play the demo at imixitup.org, although the iphone version is way better! Of course we realize that most of you will have seen similar things before but please remember, the app is not aimed at the music producer or the dj familiar with music creation software - it is for the hundreds of people who have said "I want one of those in my bedroom" when seeing the Beat Jigsaw at a festival and the thousands more like them who haven't seen it yet. Its for wannabe dj's , music lovers and anyone who can still remember how to Play! nothing happens. But again finally it's up to you. Anything submitted must be free from any copyright restrictions.By sending us your loops, you retain all ownership, rights etc and do not grant us a licence to use them in the app unless and until a formal agreement is made. versions for other platforms as well, notably Android, and break out of the walled garden into the wider world. Just got the message that the app had been accepted by Apple.